Do you dread celebrating another Christmas in your outdated kitchen? Don't despair! There is still time to give your kitchen a face lift before having your family and friends over during the holidays. 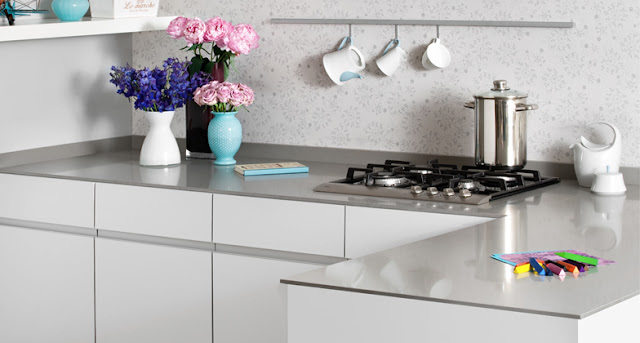 A new look may be all you need to love your kitchen again. Imagine how much a new countertop and back splash would change the overall look and feel of your kitchen. Not quite sure what you're looking for? Drop by our showroom for some design inspiration. "Receiving new samples for the showroom is always exciting. It gets the creative juices flowing," says Monarch designer Marion Cuddie. "Our recent delivery of Caesarstone's newest quartz counter samples was no exception." "Our designers were all experimenting with cabinet colours and the new samples to come up with beautiful new combinations to propose to our clients," says Marion. "If you are thinking about sprucing up your kitchen with a new countertop before Christmas, you will definitely want to see the new Caesarstone colours and take advantage of our countertop/back splash promotion. Any one of our designers will be happy to help you with the details." For more details, drop by our Pickering showroom or call 905-686-2001.